My Grandmother always had the most beautiful hydrangea bushes near her porch. As I would run past on my way to her door, blue snowflakes would seem to fall from the heavy globes forming a varying blue blanket on the ground. Her cat, Albert, peeping through from under the bush, would pounce at the petals as they flitted this way and that. As we’d sit down for Sunday lunch, the blessing would be said around a table laden with fried chicken, biscuits, creamed corn, green beans and a white ironstone pitcher overflowing with those blue hydrangea blossoms she’d clipped before church. Fancy would not be the word I would use to describe the setting, but that mophead-filled ironstone pitcher was always oddly comforting in its spot. This weekend, we hosted a party for my nephew and his soon to be bride. As my spring cleaning spree went into overdrive to prepare for the party, one thing I knew I would use throughout my house and porches was cut hydrangea blossoms. I just don’t think there is anything as pretty as a blossom tipped stems nestled in white containers. As I clipped and added to my favorite milk glass vases, I was again impressed at how quickly they add color and a polish to any room. They hold up so well and the blossoms last for days and days. I’m a firm believer that you can never have too many pairs of shoes, too many bottles of perfume, or too many hydrangea bushes. If you don’t have one on your property, you may want to ask for one for your next birthday, anniversary, or other special occasion. The best time to plant them in the south is in early fall. I prefer to buy a type of hydrangea that is a shrub instead of those that you would get from a florist. However, the ones you receive from a florist can usually be planted as a shrub, they just may not bloom as regularly as those varieties you’ll find that are more adapted for outdoors. Oakleaf Hydrangeas (Georgia native) – produces white panicle blooms throughout summer. Does not require pruning. Smooth Hydrangea (Georgia native) – produces white blooms throughout summer. Prune in early fall. 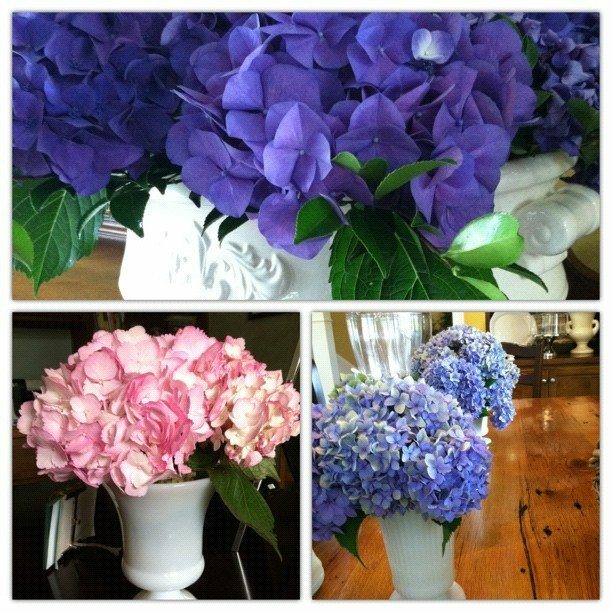 French Hydrangea – produces pink or blue blooms based on pH level of soil where planted. Prune depending on variety. For more information on hydrangeas in your area, consult with your local extension service or through the American Hydrangea Society. Are you ready to mingle? You’re welcome to share a favorite thing you’ve made – craft, sweet treat, meal, photograph, or even decor. I look forward to seeing all you’ve made! 1. If you have a blog, simply add the permalink to your post. Do not add the link to the homepage of your website. If you don’t have a blog, don’t worry, add a link from your Facebook page, Instagram, or Flickr of your photograph. 2. Include a link in your post to addapinch.com to share all of the great ideas linked up with your readers, if you have a blog. 3. Select the photo you wish to link to your site and include the title of what you are sharing! Add a Pinch is family-friendly, so please be sure the links you are sharing are as well. I reserve the right to delete any links as I determine necessary. I love hydrangeas. They are SO pretty! Thanks for hosting! Hydrangeas are just beautiful. I always smile when I see them in front of homes in our neighborhood. There’s just something so happy about them. I just clipped some Hydrangea today. They are so pretty. Thank you for sharing them with us. Have a wonderful week. Hydrangeas are so pretty! I especially love the blue ones 🙂 Thank you for hosting! Those flowers are gorgeous! You are right they just seem to liven a room up so much! Thank you for hosting! Your hydrangeas are gorgeous! Wish I had a house full of them right now! Hydrangeas…oh, how I love thee. Mom gave me a few divisions of her ‘Annabelle’ from the farm many years ago, and I have since divided and planted them around my yard. I love the small ornamental trees with the panicle blooms…on my wish list. Have a great week, Robyn! I just found a hydrangeas on the side of the house and I couldn’t be more happier. Thank you for hosting this wonderful party! I love hydrangeas so much! The shrubs grew all over in Norfolk but not so much here :-(. I Thinkthey may not like our sandy soil. But one of these days I will hve a yard full of them, even I I hve to move to Georgia!! !